Let's say tomorrow Congress passed a law that made it illegal to own more than 1 car. You could pick any car you wanted (assuming you could afford it), but once you made your choice that was it; no summer car, no winter beater, no toys, just one car. This car would be my choice... An Audi S4 Avant; a 250 HP, AWD, station wagon. Usually, when talking about cars, the words "exciting" and "practical" don't come together in the same sentence. Cars are usually exciting or practical, but rarely both. This is one of the few cars that is both. The exciting part has to do with the engine, a twin turbo 2.7 liter V6, which, when mated to Audi's 6 speed manual transmission, moves the car to 60 MPH in 5.96 seconds. (The automatic takes 6.5 seconds to hit 60, which is still impressive.) To put that in perspective, that's just a second slower than a 2001 BMW M Coupe and a second faster than a 2001 Porsche Boxter. Top speed is electronically limited to 153 MPH. The practical part is that it's a station wagon. Some of my friends make fun of my desire to own a station wagon but, if you need to carry stuff, as I do for my business from time to time, having a giant hatch to load the stuff into the car and 63 cubic feet of cargo space (with the rear seats folded down) to carry all of it, makes a lot of sense. Practical and exciting come together in Audi's Quattro AWD system. You just can't find a better AWD system in a car. On dry pavement it gives you a little extra grip on twisty roads, but on wet pavement it's outstanding, providing traction and stability that you can't find in anything other than an SUV. I once owned an Audi, a 1990 Audi 90. It's was a decent, reliable car, but not very exciting. I kept it for awhile and then traded it in towards a Saab 9000. Ultimately, I traded the 9000 in on my BMW, which, 12 years later, I still own. A few years ago I met a person who had just bought an Audi A4. Being as obnoxiously proud and opinionated about her car as I am about mine, it didn't take long for us to get into some (usually) good natured "My car is better than your car" arguments. Not wanting to lose any of those arguments, I would spend time on the internet looking for comparisons between Audi and BMW. While I found plenty of ways in which BMW was superior to Audi, I learned just how far Audi had come since building my 90. I began to respect Audi more than I ever did. Audi now builds truly exciting cars. For now I'll probably stick with my BMW and buy another SUV for the winter. But if there ever comes a time when I can't own 2 cars (for whatever reason), you'll see me in an Audi S4 Avant. The car being offered on eBay is in overall good, but not perfect condition. The seller states it has a few scratches and is a recovered theft with a salvage title. Click here to see the eBay listing for this 2001 Audi S4 Avant. 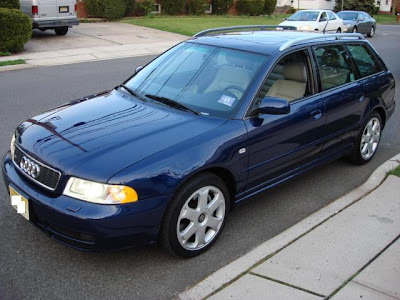 This may not be the car for someone who likes perfection or only plans on keeping a car for a couple of years and then trading it in, but, as the S4 Avant is a relatively recent car, others appear for sale fairly often. The insane (in a very good way) pinnacle of all of Audi's station wagon engineering is the RS6 Avant. With a 10 cylinder, twin turbo engine, it's capable of doing 200+ MPH (It's electronically limited to 155 MPH, though). This is an incredible car. Unfortunately, I'll probably never own one, new or used, because for now Audi has no plans on bringing the car to the US. Excellent choice! The US has missed out on a lot of great Audi's, the RS2, RS4 Avant and the newer RS6 as you mention. I have always lusted after a RS2, but living in California, I have not a chance in hell owning one. M5 Touring also would be a pick, again, if it was available in the US. Kudos for keeping your BMW for 12 whole years, hoping my GTI lasts that long.